Photographer Pete Souza Reflects On 8 Years (And 1.9 Million Photos) Of Obama As the chief official White House photographer for President Obama, Souza sometimes shot more than 2,000 photos a day. "I was there all the time," he says. 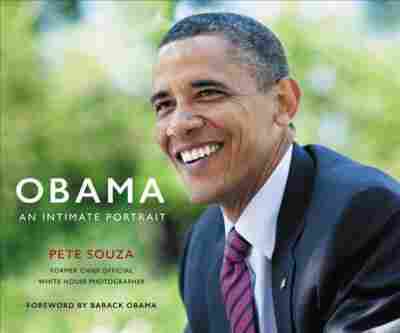 His new book is Obama: An Intimate Portrait. 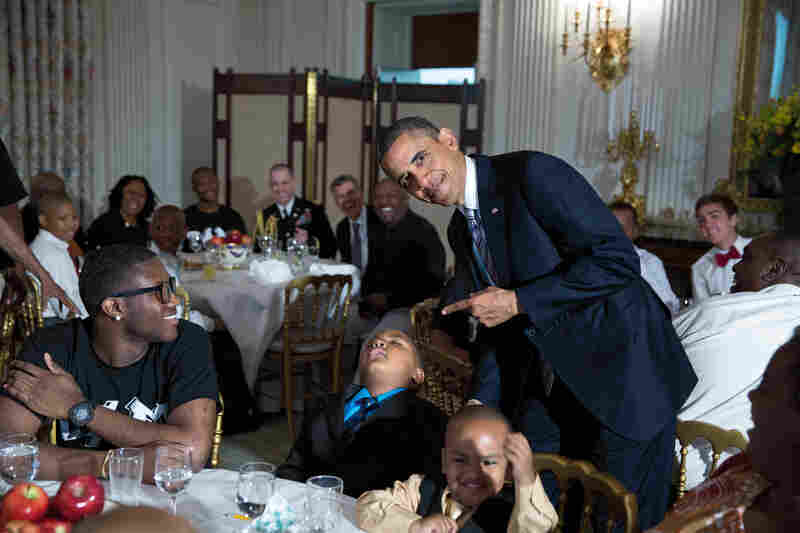 Obama poses with a boy who fell asleep during the White House's Father's Day ice cream social on June 14, 2013. Souza remembers the president calling out, "Pete, you've got to get a picture of this." 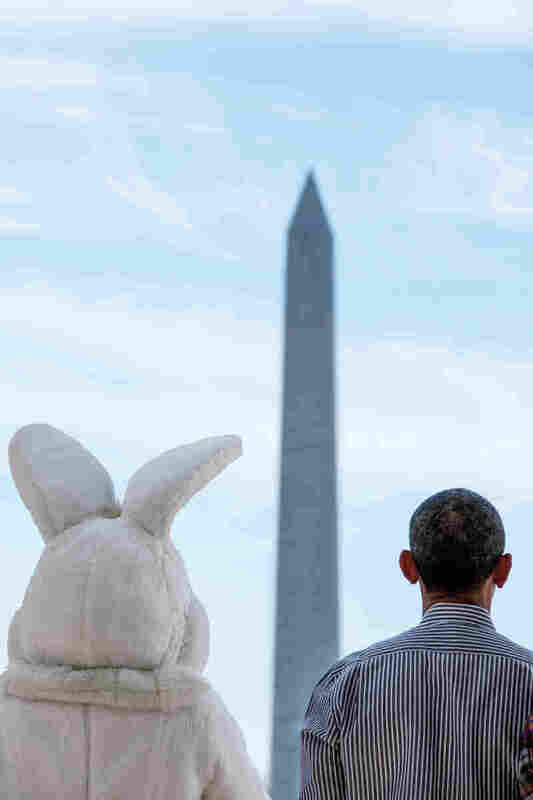 When the president saw this photograph from the April 21, 2014, White House Easter Egg Roll, he told Souza it showed "the two most famous sets of ears in Washington," and he asked for a copy to give to his daughters. 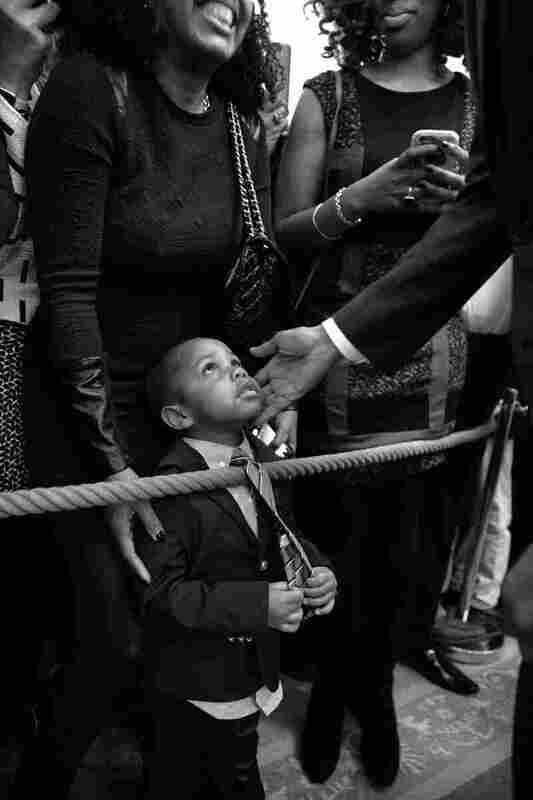 Obama greets 3-year-old Clark Reynolds at a reception celebrating African-American History Month on Feb. 18, 2016. 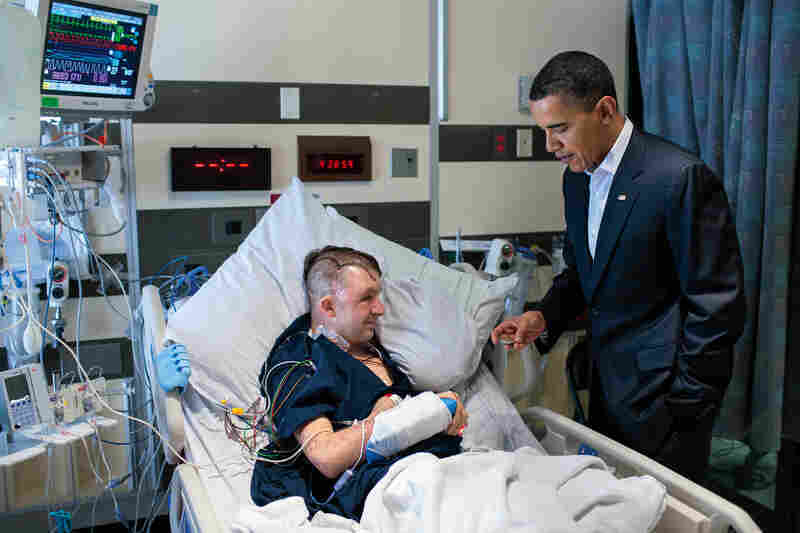 Obama meets Cory Remsburg at Walter Reed National Military Medical Center on Feb. 28, 2010. Remsburg suffered a severe brain injury caused by a roadside explosion in Afghanistan. 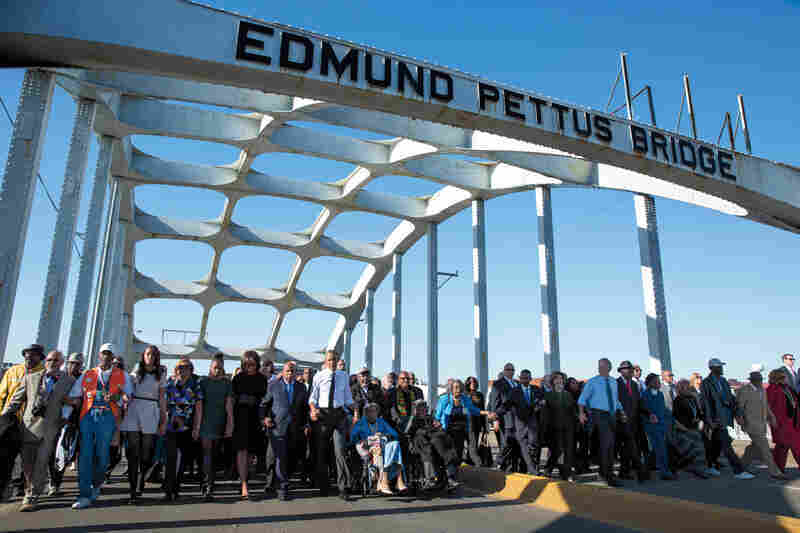 On March 7, 2015, with his family and other dignitaries, Obama commemorated the 50th anniversary of the historic protest march from Selma to Montgomery, Ala. 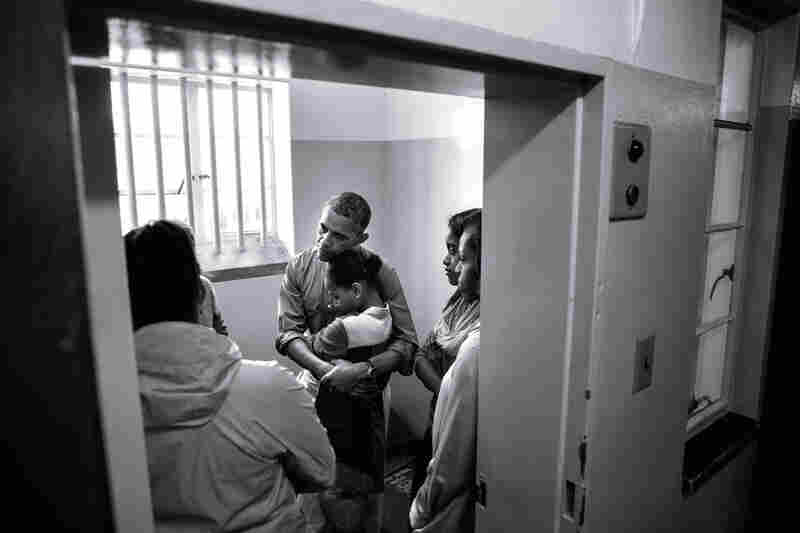 The first family visits Nelson Mandela's prison cell on Robben Island, off Cape Town, South Africa, on June 30, 2013. 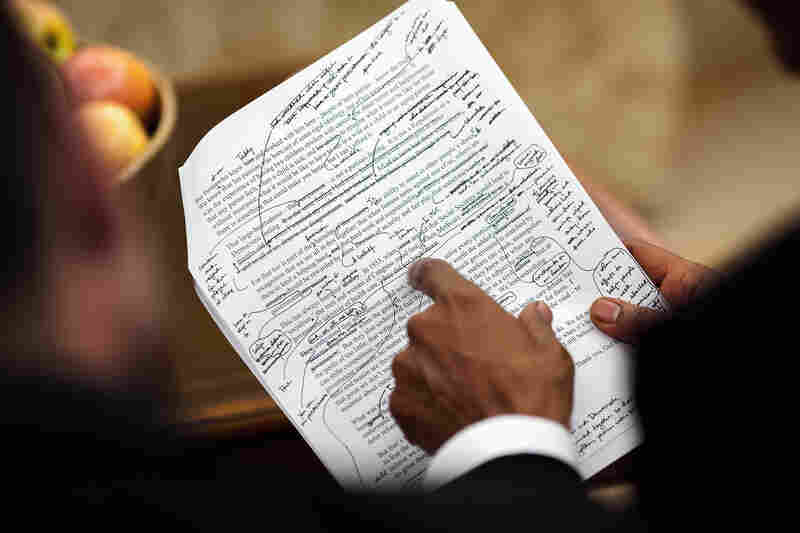 Obama edits a speech on health care on Sept. 9, 2009. 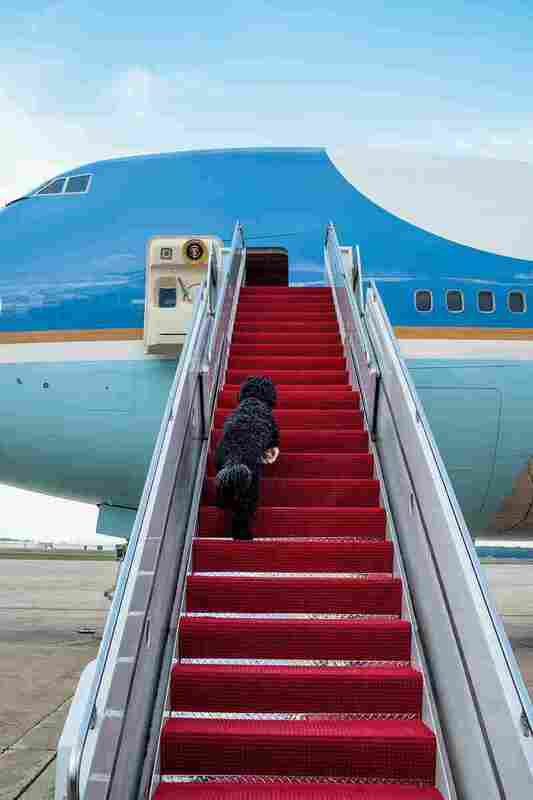 Bo, the first dog, boards Air Force One for a weekend trip to Chicago on May 27, 2010. As the chief official White House photographer for President Barack Obama, Pete Souza had top security clearance and sat in on most meetings and major events with the president. "I was there all the time," he says. "I wasn't talking to [Obama] all the time, but I was always in every meeting and pretty much every situation that he had as president." Over the course of Obama's eight years in office, Souza estimates that he took approximately 1.9 million photos — sometimes more than 2,000 each day. His new book, Obama: An Intimate Portrait, is a collection of his favorites. I had top security clearance, which enabled me to go into all these meetings, but I have to say that most of the top secret material is on paper. I was not privy to paperwork. I didn't get memos and things like that. When you're a photographer in the room in these kinds of situations, you do hear conversations, but you've got so many things to worry about technically with the camera, and then hoping to capture the moment at just the right time, composition. You can get the sense of the conversation and the mood and the emotion, but, like, I couldn't repeat verbatim conversations that took place, because, quite frankly, I wasn't necessarily listening to all of the words — just trying to get the essence of what was taking place. They were monitoring, in real time, the mission as it was unfolding. We were in that little conference room within the Situation Room for about 40 minutes, I think it was. And so during that entire time the mission was taking place in Pakistan and they were just monitoring it in real time. 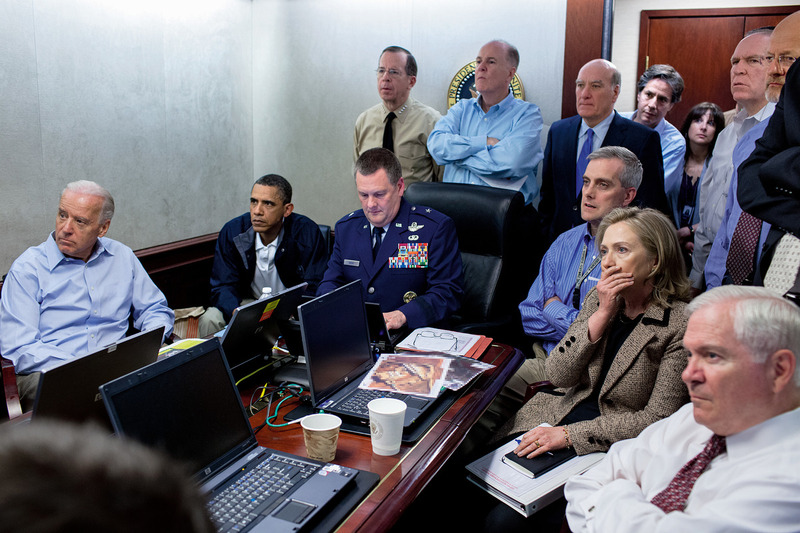 Obama and his national security team monitor the raid that resulted in the death of Osama bin Laden on May 1, 2011. The thing that strikes me about that photograph now is you have the most powerful people in the federal government — you've got the president, the vice president, the chairman of the joint chiefs, secretary of state, secretary of defense, and on and on and on — and they were essentially helpless. They had made their decision in the days and weeks before to launch this raid, but now it was up to those guys on the ground and there's nothing they could do to affect the outcome, which I think helps depict why their faces are so anxious and tense — to just essentially watch as this happens right before their eyes. It's very emotional, but I'm also worried about my composition and framing, so all these things are going through my head as this very difficult conversation is taking place. 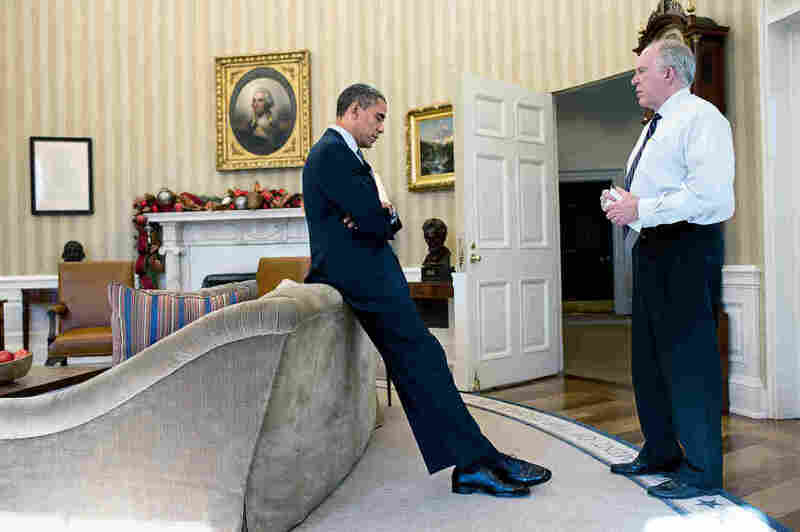 Obama learns of the Sandy Hook Elementary School shooting from Homeland Security Adviser John Brennan on Dec. 14, 2012. I always tell people that in this moment he's not reacting as the president of the United States. You see the body language. ... He's reacting as a fellow parent, just trying to imagine that you send your 6-year-old off to school — we consider those safety zones — and you've just learned that you're never going to see that 6-year-old again because some crazy guy shot them to death. This is two days after the shootings and they had planned this public memorial service. But before that, they had all the families gathered in different rooms and he went and spent I think it was three hours with all of these families. And then he came back into this classroom ... and not only is he going over his notes, he is rewriting parts of his talk that he was going to give at this memorial service to incorporate what he had just experienced during those three hours visiting with these families. 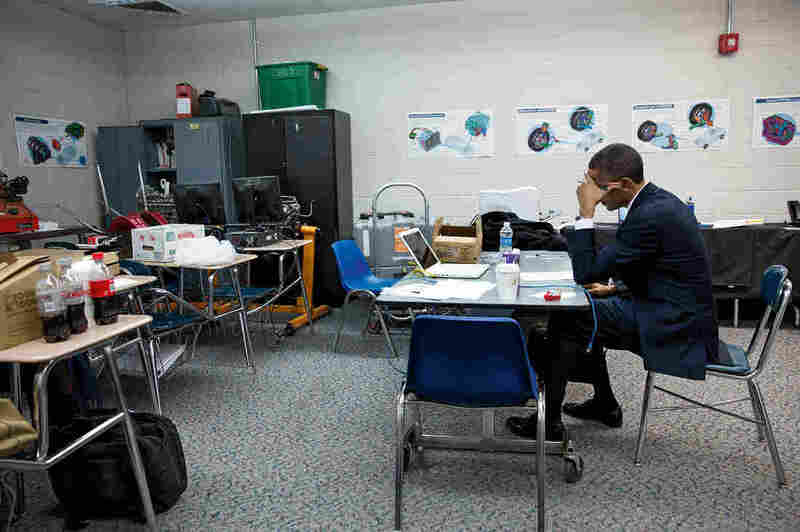 Obama sits alone in a classroom on Dec. 16, 2012, before speaking at the memorial service for victims of the Sandy Hook Elementary School shooting. I was struck by that classroom and the messiness of it, and that's why I backed off to try to give people a wider sense of him alone in this room. 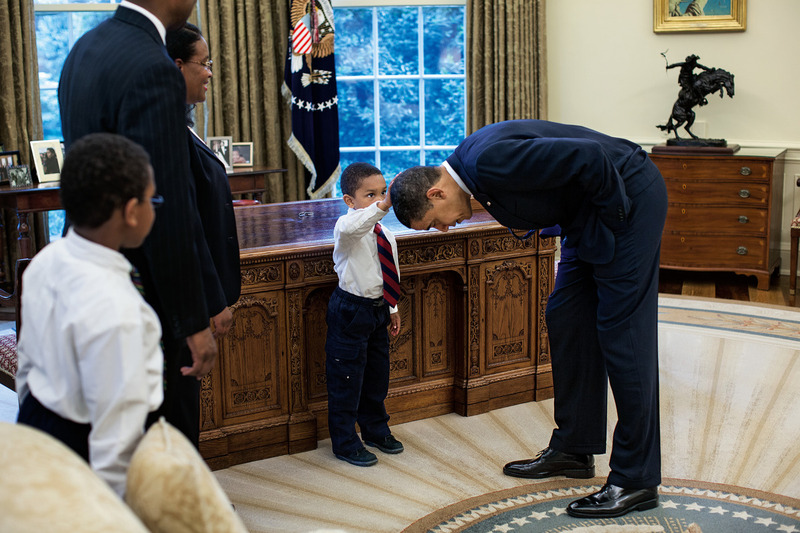 On May 8, 2009, Obama let a staffer's son feel his hair after the boy wondered aloud if it felt like his. "Why don't you see for yourself," the president replied. I guess what I see in that picture is two things: One is, here's this African-American kid who is touching the head of the president of the United States, who looks like him. And I think a lot of young African-American kids probably could identify with that moment. But it also says something about President Obama that at the behest of this innocent question from this kid, that he was fine bending over to let this kid touch his head. It's one of the few times where I thought about the image beforehand. I knew he was going to walk out of that door, obviously. And I asked one of the [general services] workers if he had a ladder nearby that I could borrow so that I could get up high, high angle, and with a very wide angle lens try to show as much of the Oval Office as possible as he's walking out the door. 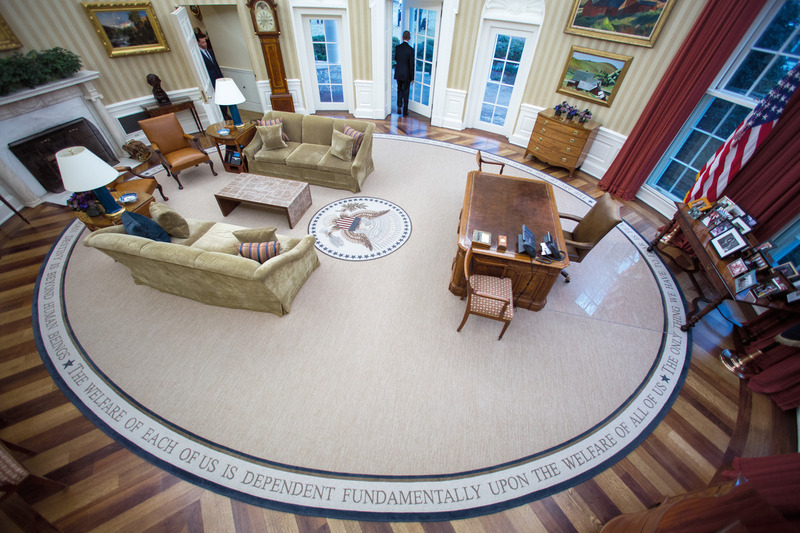 Obama leaves the Oval Office for the last time as president on Jan. 20, 2017. I think for the most part what I've tried to do with my current Instagram feed is display public domain photos and be somewhat subtle and respectful in the words that I write. I think people can interpret them [however they want to]. ... When somebody first wrote a story about "throwing shade" I actually had to look that up because I really didn't know what it meant. ... I kind of laughed, I guess. I'll say this: I do think that compared to what some people write on Twitter, I'm being very respectful in the way that I present my Instagram feed. Sam Briger and Thea Chaloner produced and edited the audio of this interview. Bridget Bentz, Molly Seavy-Nesper and Nicole Cohen adapted it for the Web.